The Durham Bulls wrap up a 10-game homestand Friday evening with a 7:05 contest against the Norfolk Tides. But no matter how the ballgame turns out, one thing is already certain: there won't be another homestand quite like this in 2012. For starters, this current slate of home games coincided with the arrival of veteran outfielder and designated hitter Hideki Matsui, who is playing with the Bulls after signing a Minor League contract with parent club Tampa Bay. Matsui, of course, is no ordinary Major League veteran. In addition to his considerable name recognition here in the States, the 37-year-old slugger is a bona-fide superstar in his native Japan and has been for nearly 20 years. Thirty-five members of the Japanese media are on the Matsui beat, their professional existences dedicated solely to covering his every move. It became the Bulls' job to accommodate them. As if that wasn't enough, just two days after Matsui's arrival, he faced off against none other than distinguished fellow countryman Daisuke Matsuzaka. The 32-year-old right-hander, currently recovering from Tommy John surgery, visited Durham as a member of the Pawtucket Red Sox. Fifteen more members of the Japanese media followed close behind (bringing the total to 50, if you're keeping track). And because too much is never enough, Matsuzaka's May 17 start in Durham was bookended on both sides by the rehab of Red Sox first baseman Kevin Youkilis. His performance was closely monitored by the fervent followers of Red Sox Nation, of course, but on the plus side at least he didn't have his own traveling media contingent. So how does a Minor League team deal with such a confluence of events? On Thursday afternoon, Bulls director of marketing Scott Carter took the time to explain how it all went down. "We'd heard rumors of Matsui signing [with the Rays] in April, and once we heard that he was going to sign a Minor League contract, it became pretty obvious that he'd come here," said Carter, a veteran Minor League executive who is in his first season with the Bulls. "But when? What's the timeline? How to get the information out there -- that's the toughest part." 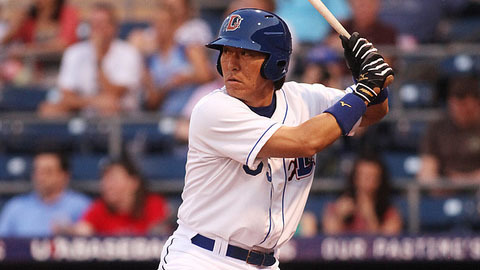 Upon signing with the Rays, Matsui's first stop was the team's extended Spring Training facility in Port Charlotte, Fla. On Saturday, May 12, the Bulls received official word that Durham would indeed be his next place of professional employ. "We heard that he'd be here Tuesday but also that it could be Wednesday. It changed five times in the span of two days. So we spent all day Monday prepping for something that we didn't know would be happening for sure," said Carter. "Finally we got word he'd be landing here Tuesday, but at that point he was in Toronto getting his visa. There were two flights coming in from Toronto that day, one landing at two and the other at 11. If he was arriving at two, then he'd be playing in the homestand opener that night." After two Pelicans produced a no-no Saturday, Brett Cecil and two Fisher Cats bit the Sea Dogs Monday. Though he backslid a bit Wednesday, Tervor Bauer aced his Triple-A debut vs. the RedHawks last Friday. Wil Myers connected for his first Triple-A homer Tuesday, then launched a tape-measure shot the next night. Who will be master of the MiLB mascot domain? It's time for you to make your picks among the starting 64. Triple-A hasn't treated Dice-K gently and you can watch Toledo take on the rehabbing righty Saturday in Pawtucket. The Orioles' top pitching prospect Dylan Bundy steps up a level when he takes the mound Saturday in Frederick. On Tuesday morning the Bulls found out that Matsui would indeed be arriving at two and playing that evening. Carter immediately sent out a press release announcing the fact, but there was plenty more where that came from. "Tuesday was insane. That same morning we got confirmation that Dice-K would make his rehab start on Thursday, and soon after that we found out that Youkilis would be joining the PawSox and was scheduled to play Wednesday," Carter said. "So all three of those releases were sent out on the same day, all while we were preparing for Matsui to arrive." Not just Matsui was arriving, of course. There were the aforementioned 35 members of the Japanese media arriving in his wake. Matsui's public relations director, Isao Hirooka, sent Carter a list of these individuals' names and the team began preparing the proper credentials. "It's a tough thing to handle all of these requests, having no intrinsic knowledge of the Japanese media. How do you know who to prioritize?" asked Carter. "If it was Derek Jeter here on a rehab assignment and the New York Times called and said, 'Hey, we're going to cover this,' then I can take care of that. You make sure that person is set up in the first row of the press box. With the Japanese media, it was very hard to discern who deserves what level of attention." Not that there was much room in the press box to begin with. To accommodate the Japanese media, the team had to improvise on a night-by-night basis. Sometimes they were housed in suites, but on nights that suites weren't available, they were placed in otherwise blocked-off seating areas that served as de facto auxiliary press boxes. "I think the smartest thing we did was set up a working media room, like they do at the Baseball Winter Meetings," said Carter. "It was basically an empty room in the bowels of the stadium, but it gave them access to power outlets and the internet. These guys needed a place to work, because they arrived at the stadium at 2:30 every single day. They didn't want to miss a thing." Despite the myriad hassles of accommodating 35 foreign guests, Carter had nothing but praise for the Japanese media. "Working with them is so rewarding because they are so appreciative. They ask a lot of questions, but only because they want to understand the context. I don't know how long Matsui will be with us, but I'll be sad to see these guys go. They've been so pleasant to deal with." Tuesday featured Matsui's Durham debut and Wednesday's game included both Matsui and Youkilis, but that was all a mere prelude to Thursday. Two of Japan's biggest superstars improbably facing off in a Triple-A ballgame: Dice-K vs. Matsui. About 10,000 fans flocked to Durham Bulls Athletic Park for the occasion, and Carter compared the atmosphere to that which can be found on Opening Night and the Fourth of July. "We had rainstorms coming in and decided to delay the start of the game until 8 p.m. As crummy as it was to wait that out, it meant that once the game started, the place was absolutely packed to the gills," he said. "That first at-bat between Matsui and Dice-K felt like a Major League playoff game -- the excitement was that palpable." Matsui grounded into a fielder's choice in that at-bat, but the Bulls plated a run in the frame en route to a 5-0 win. Dice-K took the loss, and after he exited the game in the seventh inning, he retreated to the clubhouse area to do an in-game press conference. This was followed by a post-game Q-and-A with Matsui. Your browser does not support iframes. "Those big press conferences were about as MLB as you can get, with the Japanese and American media asking questions and a backdrop behind the players," said Carter. "Luckily we had had the foresight to sell the sponsorship [of the press conference backdrop] to a Japanese company." After all that, Carter jokes that Friday was "back to just Matsui and Youkilis, no big deal." But it certainly wasn't a typical night at the ballpark. "Friday was Star Wars Night, one of the most surreal moments of my career. We were going to do a skit on the field involving Storm Troopers, and they were waiting in the stairwell leading up from the clubhouse. They're not very mobile in those costumes, and can't hear well, and soon I see Matsui coming up the steps from the batting cage. The Storm Troopers were in his way, and couldn't even tell he was coming. I had to tell the Storm Troopers to move out of the way so Matsui could get past." Upon the conclusion of this Friday's game, the Matsui Minor League circus will make its way to Norfolk and then Indianapolis. Though Carter is rooting for him to do well, he admits that he wouldn't mind if the venerable slugger is still with the Bulls when they return for their next homestand on June 5. "Selfishly, we'd love to have him because people just love to see him play," he said. "I'm not going to get tired of Tweeting out the lineup each day, writing that Matsui is batting fourth. That's the kind of thing that just doesn't get old."